Extracorporeal Pulse Activation Technology (EPAT) revolves primarily around using a particular set of pressure waves that encourages the metabolism, improves blood circulation and speeds up the healing process. In turn, damaged tissue regenerates and heals. As a non-invasive office-based procedure, Extracorporeal Pulse Activation Technology (EPAT) represents a great advancement in treatment options for a wide range of musculoskeletal conditions. Extracorporeal Pulse Activation Technology (EPAT) eliminates pain and restores full mobility, therefore improving quality of life. The benefits of Extracorporeal Pulse Activation Technology (EPAT) are typically experienced after only 3 treatments. Immediate pain relief is sometimes reported after treatment, though generally pain relief can take up to 4 weeks to begin. Over 80% of patients treated report being pain free and/or experiencing a significant reduction in pain. Non-invasive Extracorporeal Pulse Activation Technology (EPAT) has virtually no risks or side effects. In rare cases, patients may experience minor discomfort for a few days. Slight residual pain after intense exercise or a full day of work is normal. Extracorporeal Pulse Activation Technology (EPAT) is safe. The technology is FDA approved and has had extensive clinical studies and tests confirm its safety and efficacy. Extracorporeal Pulse Activation Technology (EPAT) was originally developed in Europe and is currently in use around the globe. If administered by a qualified professional, Extracorporeal Pulse Activation Technology (EPAT) has virtually no risks or side effects. Extracorporeal Pulse Activation Technology (EPAT) treatment sessions take approximately 5-10 minutes. Time depends on the disorder being treated. Generally, 3 treatment sessions are needed at weekly intervals. To enhance effectiveness, coupling gel is applied to the treatment area. After applying the gel, Extracorporeal Pulse Activation Technology (EPAT) pressure waves are released via the applicator which is moved over the area in a circular motion. Extracorporeal Pulse Activation Technology (EPAT) has a proven success rate that is equal to or greater than that of traditional treatment methods (including surgery) and without the risks, complications and prolonged recovery period. Extracorporeal Pulse Activation Technology (EPAT) is performed in your podiatrist’s office, does not require anesthesia, and requires a minimal amount of time. Patients who use this method can immediately bear weight (i.e. walk) and return to normal activity within a few days of the procedure. Extracorporeal Pulse Activation Technology (EPAT) is a modern, highly effective, and non-invasive FDA-cleared treatment method that involves the application of acoustic pressure waves to affected areas of the body. 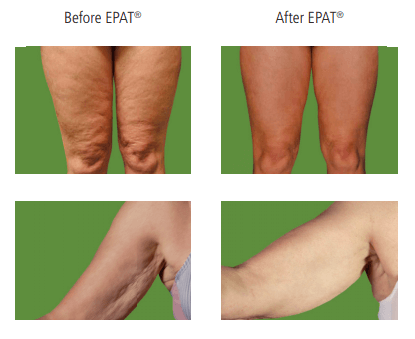 EPAT has become a leading modality in treating cellulite, strengthening collagen fibers, and increasing skin elasticity, tightness, thickness, and tone. In podiatry, EPAT is also useful in treating foot and heel pain, tendon pain, neuromas, and trigger points. 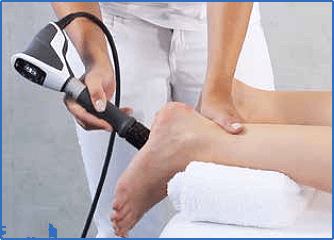 EPAT involves the application of acoustic pressure waves to the body in the form of high-frequency oscillations. These waves are introduced via a radial applicator, which is moved over the region that is being treated. Coupling gel is typically applied to the treatment area to enhance effectiveness. Treatment takes approximately 20 minutes, depending on the number of areas treated. 8-12 treatment sessions are generally needed. For more information about Extracorporeal Pulse Activation Technology (EPAT) and how it can benefit you, contact your podiatrist today!